So… it’s that time of year where I wrap up 2012 and look ahead. 2012 was a very hard year for some, a good year for others, and a mixed bag here in the Woods. I’ll get around to reviewing the year in knits and books… eventually, but I did an okay job with my resolution to focus on “enough”. I still feel I need to be all things to all people, but I’ve gotten much better at focusing on what I am TRULY responsible for (and that’s a’ plenty) and letting the other stuff do what it will. 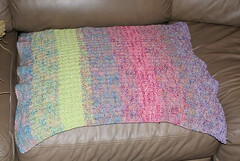 I didn’t do much knitting this year, but I did a lot of reading, and logged a lot of miles with the fur-girls. But for the record, I do love capes and tights, so I think I’ll continue to focus on “enough” in the upcoming year too. That’s about as close to a resolution as you’re going to get from me, but I will share my reading, knitting and fitness mileage goals in another post or three! Wishing you peace, joy and “enough” in 2013! … a Skirt Sports Toasty Mitts Sweater. I presume I have the red, but it’s more of a super-hot PANK. It’s definitely not “dusty” enough to be the berry color. What you can’t see in the photos is that the front zipper and the rear pocket zipper are both reflective. And those mitt-things? So awesome. Just what I need, so that I have SKIN on the leash and really feel I have a good grip on Sissy. They’re very easy to slip on and off too. The only con is that Lululemon has spoiled me, and I expect fabrics to wick away moisture AND feel like buttah on my skin. The Knight insisted the top was a stand-alone TOP, but I doubted him and wore a tee underneath. Um… I’ll be wearing a long-sleeved tee underneath in the future. The black part of the sleeves were rough and frankly, my arms were quite chilly. Still, I’ll be watching for it to go on sale, hopefully in the berry color! Are you still Christmassing? Any exciting weekend plans? Happy Boxing Day! I miss December 26th at my stepmom’s homeplace. I miss the spoonbread, the Virginia country ham biscuits (really… all ham biscuits should be two-bite-sized and feature thinly sliced, very tender country ham), her SPECIAL egg nog, cheese biscuits (think cheese “cookie” with a half pecan pressed on top), and tremendously good cheer. Knowing Boxing Day would happen made it easier to be a good sport and work Christmas Day when I was a paid firefighter. 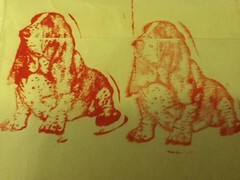 I’m sure Sissy would love to have a stamp. Of course, then Gretchen would want one too… hmmm… I think I’d get plenty of use out of them though, don’t you? Next up is this fun floral arrangement. 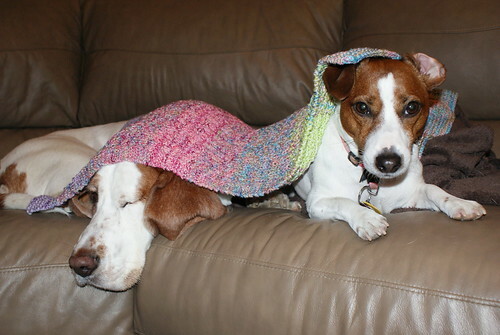 I got my first “mum dog” when I had back surgery, so when another local basset-mom was in the hospital, I knew just what she needed. 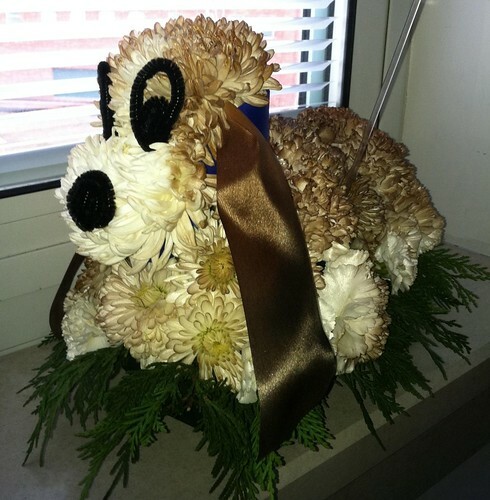 Our florist asked only for an extra day to figure out the ears and other basset modifications, and the result was definitely worth it! Wouldn’t that cheer you up? Well, this post is long enough, so tune in tomorrow for the final chapter in our tale of how the love of hounds makes the world go ’round. We hope you had a great Christmas. Here in the Woods, this is the second day of Christmas, and my true love is giving me – well, my beloved car – a transmission flush and some other necessary maintenance. Does anyone else celebrate Christmas through Epiphany? I’m off to run a few last-minute errands, but The HoundDogs have inspired me; I think Sissy needs some mistletoe! Wishing you and yours a very Merry Christmas from our house to yours. Gretchen is lobbying for royalties and the lawsuit that would be necessary to make them happen. Hem. She’s supposed to be my not-trouble-maker!! 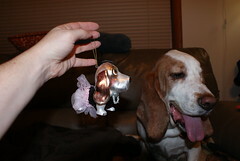 Ornament hound is a tri-color… maybe. Sis is registered as a lemon and white, but is arguably only two colors – reddish-lemon and white. Ornament hound has no freckles, and Sissy has freckles everywhere, especially on her feet and legs. Now, Susan’s Gg-like present is also quite the look-alike. Dock the tail and it’s pretty darned close too! Puppy Gg around 4 months. Which gift do you think is most like the fur-girl it represents? 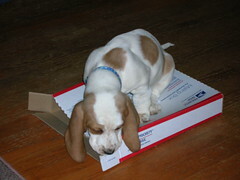 Do you collect items of your dogs breed or likeness? I want to do theme trees one year. I think we almost have enough to do both a fire department themed tree and a dog-themed tree. 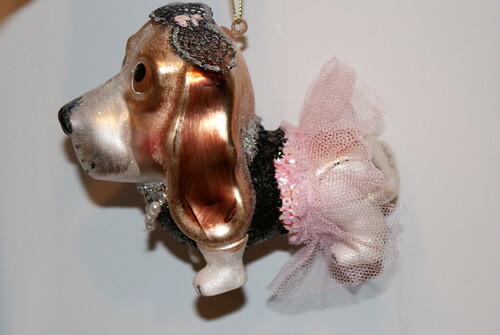 I’m pretty sure the bassets are the dominant ornaments; I just don’t find as many Jack Russell ornaments for some reason. 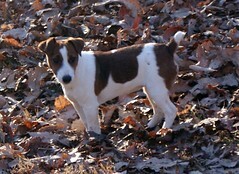 Odd, given that JRTs (or any AKC variation on the breed) are very popular in these parts. Thankful? I’m thankful for thoughtful friends who REALLY get me and my dogs. I’m thankful for friends and relations whom all seem to be focusing more on the reason for the season than on shopping and gifts. And I’m thankful for the special times with friends and family that happens around Christmastime each year. Yesterday was a put new stuff through its paces day in my dog walking time slot. Every once in a while (read: more regularly than I care to admit) I check to see what Lululemon has in its We Made Too Much section. Recently, I found the Run with Rover pant there. Why yes, I am reminded of MC Hammer when I first glance at them, but don’t judge; the inside is velvety soft and wicks moisture, and the outside is water and wind resistant. The extra fluff around the last area women want fluff actually sports deep, really functional pockets, front and back, left and right. It just so happened by late afternoon yesterday, it was quite windy and still damp from the rain earlier in the week. I’m waiting for the black to get marked down even further. They also have the same inner “legging” and outer looser design in the same fabrics in the Dog Runner pant, but at $118 I don’t see it happening. (I can’t repeat what Santa said when I sent him a link. It was profane and questionned my mental health.) I also think that despite the weird fluff at the hips, I like the Run with Rovers better, because I don’t have to have those hemmed, don’t have excess fabric to slosh in the mud and muck, etc. I also broke my own rule and wore my new trail shoes on a 4-mile walk. I had a pair of Teva sandals years ago and literally wore them out, and I’m not at all happy at the comparatively low mileage I’m getting out of both pairs of trail runners I bought in August. I usually get at least 600 miles out of running/walking shoes, and as I rotate between 2-3 pairs, even at 20+ miles per week, that means a pair lasts at least 8 months. Wrong. Both my Rykas and my Brooks are shot on the soles. They’re slick as snot already. I don’t know if it’s because to get to my trails, I cover tar and gravel and a section of cement-paved road or what, but 4 months is TOTALLY unacceptable. Anyway, I found the Teva Genea on super-sale at 6pm.com, so I’m giving them a try. After wearing running shoes for those four months, the sole is really stiff, but the cushioning/comfort factor is quite high, and the shoes felt great on the trail, gravel and in the fields. They were definitely too firm on the harder surfaces, so while I did run in them yesterday a bit to see how they fared, I will reserve them for the days we do more real “hiking”. Given my tendency to get blisters, I’m happy to report that even in my usual spots with the broken-in shoes, I had no blistering. The shoes are about twice what I paid for them now on 6pm.com but they’re still a bargain at less than $60 if you like a firm-soled, well-cushioned hiker in the fur-girls signature colors. Are my price points and expectations out of line?